Developer / Publisher: Trion Worlds. 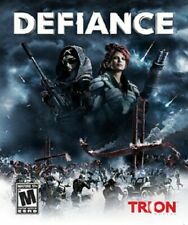 DEFIANCE (PC DVD-ROM, 2013) *COMPLETE* SHIPS FREE Mon-Sat! 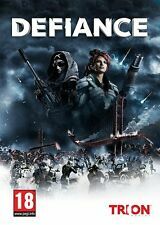 4.5 out of 5 stars - DEFIANCE (PC DVD-ROM, 2013) *COMPLETE* SHIPS FREE Mon-Sat! 2 product ratings2 product ratings - DEFIANCE (PC DVD-ROM, 2013) *COMPLETE* SHIPS FREE Mon-Sat! Publisher Trion Worlds. Genre Shooter. Platform PC. Release Year 2013. Create a unique character and level up with diverse customization options. Hunt alone or with others as you improve your skills and unlock powerful modern and alien weapons that will help you survive the massive battles that await in this constantly evolving online world. 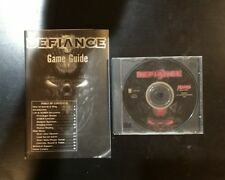 Up for sale is Defiance for Windows PC from 1997. Includes case, game disc, and manual. Please see pictures for condition as they are of the actual item you will receive. Feel free to ask any questions you may have and thanks for looking! Limited Edition with Volter shotgun and 500 buts free. Defiance PC DVD-ROM software game RATED M BRAND NEW SEALED! Video genre =action. A Massive, Persistent World - Fully realized, persistent open world (no loading screens between zones) set in a futuristic San Francisco Bay Area, supporting tens of thousands of live players. 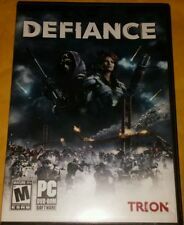 4.5 out of 5 stars - Defiance PC DVD-ROM software game RATED M BRAND NEW SEALED! 2 product ratings2 product ratings - Defiance PC DVD-ROM software game RATED M BRAND NEW SEALED! 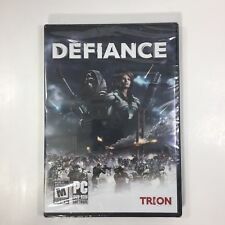 Title: Defiance (PC CD) Item Condition: used item in a good condition. 7 Reserved for future use. 6 China China. 3 Southeast and East Asia Breakdown of countries. 0 Multiple Areas Titles can be either NTSC (generally if they originate from the US) or PAL format(EU). You are Buying NEW - DEFIANCE - PC (DVD-ROM) sealed. It is in New Condition. See pictures for item condition. A Massive, Persistent World - Fully realized, persistent open world (no loading screens between zones) set in a futuristic San Francisco Bay Area, supporting tens of thousands of live players. Rated M Mature. Trending at C $6.69eBay determines this price through a machine-learned model of the product's sale prices within the last 90 days.